An Ankara court on Wednesday sent four students from Middle East Technical University (ODTÜ) to prison for “insulting” President Recep Tayyip Erdoğan with a placard they carried during the university’s graduation ceremony, the state-run Anadolu news agency reported. At leats 15 students were detained by police on Saturday after carrying a placard bearing a famous caricature of Erdoğan, called “Tayyipler Âlemi” (The World of Tayyips). The caricature was first published in 2006 by the Penguen political satire magazine, against which then-Prime Minister Erdoğan filed a lawsuit. However, an Ankara court had dismissed the suit, citing freedom of expression. 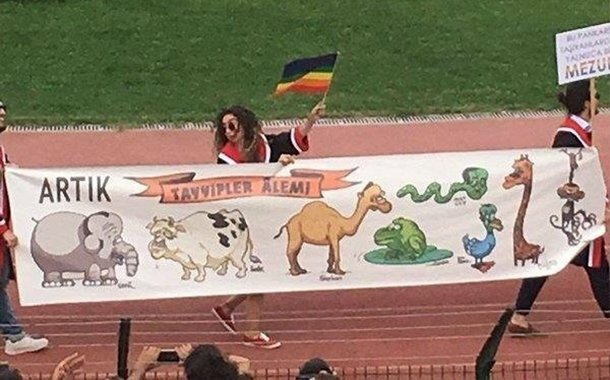 ODTÜ’s graduation ceremonies for years have had a tradition of humorous and critical placards about current political developments in Turkey.